I kinda live on Mountain Dew. I am, to be truthful with you dear readers, a gamer at heart. When not slogging through massive craptons of engineering homework or tasting and writing notes, I'm usually either doing three things: listening to music while surfing the net, reading, or playing video games. With a very emphasis on the last. I have no shame in saying that, as Sniper on Team Fortress 2, I have 50ish hours logged. In Final Fantasy XI, I have 200ish days worth of time logged over 6 years. It's kinda my bag, baby. Nothing keeps me going through an adrenaline soaked video game party or up late at night working on Physical Chemistry than Mountain Dew. Mountain Dew is a beverage best served ice cold, on ice. Warm it is palatable but akin to drinking lemon-lime motor oil, thanks to the luke-warm brominated vegetable oil in it. But the thing that kills me the most about Mountain Dew: they use that damn high-fructose corn syrup. That stuff just makes it sickeningly sweet and mouth-coating. If I didn't love the hell out of it ice cold, it would be intolerable. 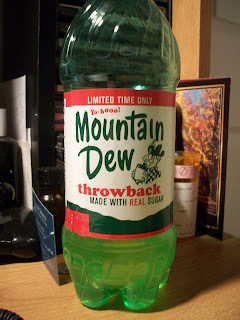 However, my keen-eyed ma found me a promised bottle of Mountain Dew Throwback at the local BP today. Mountain Dew Throwback is Pepsi's way of saying: "We're sorry we're using HFCS. Here's what real soda should taste like. But not for long, because its a limited edition product because we hate you and we're cheap". Thanks, Pepsi. Here's a picture of the luscious bottle. Note the old-timey label with the "hillbilly" getting his hat shot through by a cork. Mountain dew is technically a term for moonshine and Mountain Dew used to be used mainly as a mixer before caffeine was added and it grew a pair. Anyway, the flavor. The Dew of today is similar to the old style in flavor. Lemon/lime is strong with the orange juice base to support it but the sugar really shines. It's actually quaffable. It isn't syrupy sweet and oddly viscous but rather clean and fresh. The sweetness is subdued and less "in your face". It's also a lot less carbonated as well. Cracking a fresh can of Dew is the equivalent of pulling the pin out of a grenade and throwing it straight up in hopes that it won't blow your head off. Opening this bottle yielded a tiny little "pssh" and no foaming, which was a pleasant change from the citrus depth charge they usually are. Anyway, I'll lay this on the line for Pepsi, nice and clear: KEEP MOUNTAIN DEW THROWBACK. It is -significantly- better. It actually tastes like a decent beverage instead of a diabetic coma in a can coupled with the explosive power of a small nation. However, keep the old ones around so that I can tie strings to the pop-tops and booby trap my house in the event of a zombie apocalypse. Seriously, they're ordinance. No lie. Wow - highlight of my day dude. Which BP did you find it at? I'm going to agree about the Throwback... but did you get a weird aftertaste from it like I did? I find throwback to have an aftertaste kind of like a hard candy so I like it better on ice and even add some ice cold water sometimes. I absolutely love the lack of mouth coating slime.